Did I ever mention how much I love to travel? I love every part of it. I love deciding what to take – making mental lists of outfits to pack, maximising the mix-and-match top and bottom options. I love the throwing everything in a suitcase and zipping it closed emphatically. I love the feeling of adventure as I say ‘See ya!’ to home and start putting myself into the place I’m going. I love checking in, dropping my bags, zooming for my gate (I don’t especially love the security bit, but it’s all part of the deal). I love settling into my seat. Airplane mode, check. iPad iPhone magazine drink bottle, check, check check, check. I love take offs, landings, and the bits in between. I love arriving at my new place, jumping in a cab or onto a train, figuring out how to get there. And I especially love hotel rooms (I told you about this already, remember?). And then I love packing up and moving out. Heading home. 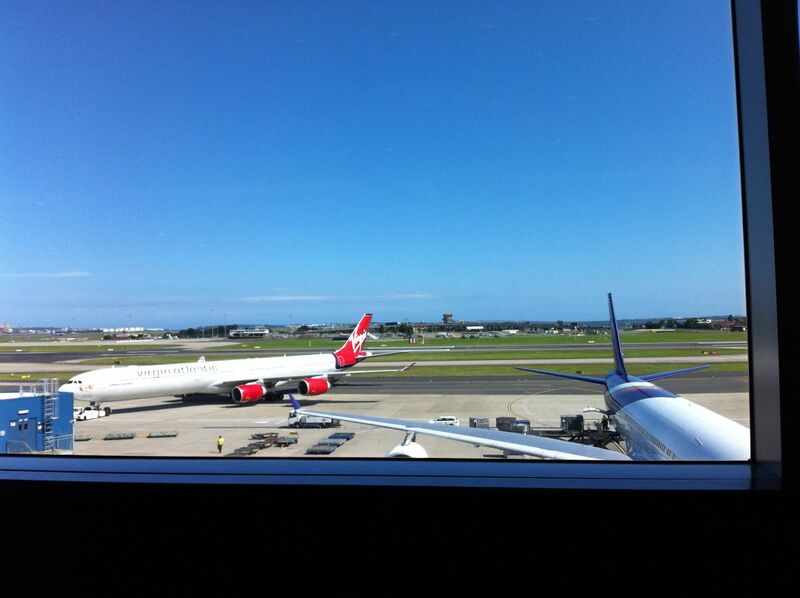 Winging my way back to my family, who are always happy to see me and to hear about my adventures. Going away makes me love coming home. I got a new tattoo for my birthday. 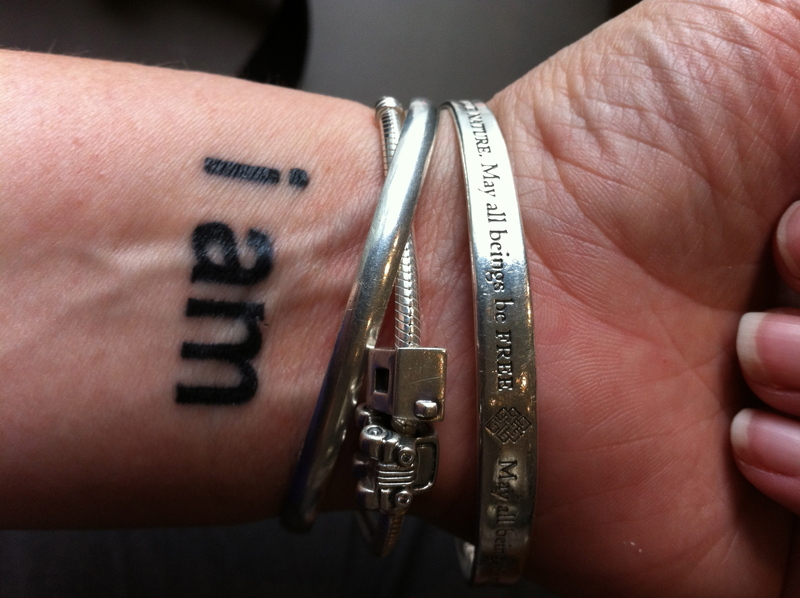 It’s on my left wrist and it says I AM in big bold letters. It’s something I’ve wanted to get for a long time, and using it to mark the last year of my 30s seemed about right. It has multiple meanings and they are a little hard to describe in words. But let me give it a try. First and foremost, the letters represent myself and my children. And then connected to this is a statement of the nature of my being. I am. I am who I am because of their existence. They are all tangled up with the person I am. I know, it’s pretty deep. Who am I? This question is not answered by the tattoo. Because I am … lots of things to lots of people. Who I am has changed so much in the past few years. My tattoo reminds me of this. I want to keep changing and growing. It reminds me not to be afraid of the future because I will develop into the person I am in that future. But I am also the person I’ve always been too. I am ever-changing, but I am also me to my core. Told you, it’s hard to put into words. It also reflects one of my very favourite paintings: Victory Over Death 2, by Colin McCahon. And finally the letters are specifically in Helvetica bold 18 point font. 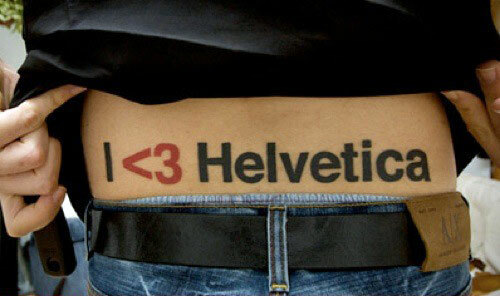 It’s my favourite font. Yes I have a favourite font. Yes I am a nerd (and technically it’s a typeface, but you know what I mean). It’s a beautiful and infinitely usable font. In fact it is one of the most well used fonts around. You’ve seen it all over the place without even realizing it. Helvetica is used a lot in advertising – it’s used in the logo for American Airlines, Lufthansa, 3M, Mitsuishi, Panasonic, and Microsoft. More importantly, it is the basic font for Apple’s operating system. It even has a movie dedicated to exploring its delicious roundy-ness. And now it’s on my wrist.